Elastic Drawstring Closure could cover approx.18"-31"(45-80cm),Overall Length approx.25"(65cm),Bottom Circumference approx.88"(224cm). 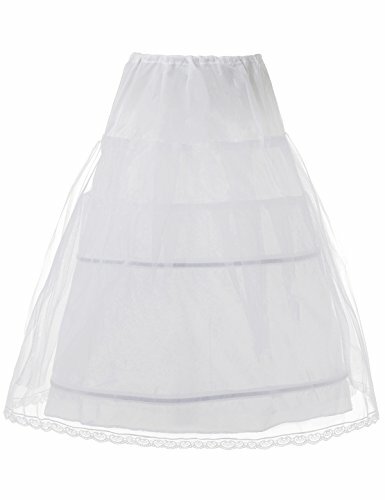 This underskirt is the Perfect Accompaniment for Wearing Under Flower Girl Dress, Pageant Dress, Communion dress,wedding flower girl dresses, birthday parties, Easter, special occasions or everyday dress up. This is limited to CHILDREN.Soft fabris prevents scratching sensitive skin. This slip was designed to make your dresses looks more pluffy and beautiful.Most dresses need a crinoline underneath to further accentuate the fullness of the silhouette and keep its shape. If you have any questions about this product by Artwedding, contact us by completing and submitting the form below. If you are looking for a specif part number, please include it with your message.